Tiny yellow buttercups grow along the wall in Lucca, beautiful against a view of distant hills. I’ve been waiting, not very patiently, for spring to arrive in Lucca. Winter and early spring were unusually cold and rainy this year and the little hints of spring that showed up in early April were fleeting - the tease of just one warm day followed by several days of clouds, rain, and cool temperatures. The trees along the wall remained stubbornly bare, lemon trees remained in the limonaia, and vines were stark without even a hint of new growth. I began to doubt that the sun would ever come to stay, that trees would sprout leaves, or that flowers would bloom. Flora (the Italian goddess of flowers and spring) seemed to have deserted me. The trees along le mura (the city walls) are now green with leaves, tiny yellow buttercups bloom along the walls, and the sycamores in Piazza Grande (also called Piazza Napoleone) provide a beautiful green canopy around the square and the now-busy carousel. This week I visited my favorite garden (on the grounds of Palazzo Pfanner) and found that the lemon and orange trees had been moved out from their winter home in the limonaia and were full of fruit. Showy peonies were blooming as was a magnolia tree and several bushes. Can roses and hydrangeas be far behind? How I hope they bloom before I head home to the U.S. in a few weeks. The most dramatic and lovely proof that spring has truly arrived comes in the form of the glicine (wisteria) that have bloomed throughout Lucca. They spill over walls and terraces and across arbors with their soft colors and long flower heads. For me, it isn’t spring until the wisteria bloom. I noticed the first wisteria blossoms along the wall that encircles the historic city. I then spent an afternoon wandering through town to the spots where I remembered the most stunning displays of wisteria from past years. 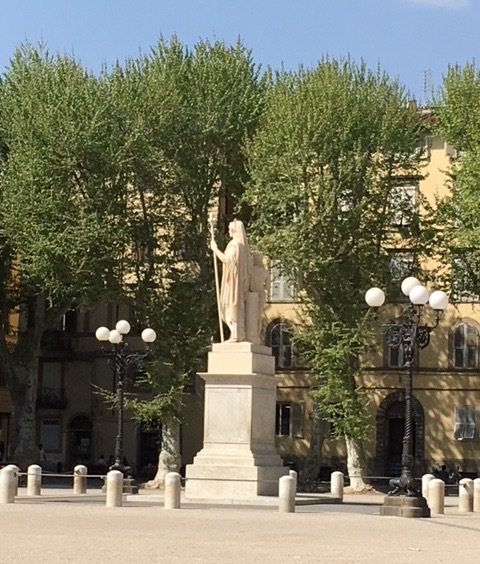 While a few had not yet bloomed, several of my favorites, in Piazza Parigi and Piazza Antelminelli (pictured below), were just as beautiful as I recalled.